Kitchen fires are caused by several factors — overheated cooking oil, hot pads or kitchen towels accidentally left on a hot burner or appliance, faulty wiring in appliances or the walls. There are many things that can cause a kitchen fire, which is why it is important to have a smoke detector installed in the room or an adjoining room. This guide will provide information about the best smoke detectors on the market. Ionization detectors respond to “fast-flame” fires. Photoelectric alarms can detect a smoldering fire before it erupts. Dual sensor alarms are a combination of ionization and photoelectric technology. Smart Home integration alarms provide a wide range of features to keep your family and home safe from kitchen fires. These detectors are great for detecting fast-moving cooking fires or fires caused by burning paper or other flammable materials. They are dangerously slow at detecting smoldering fires (up to 50 minutes), which can pose a great risk for deadly smoke inhalation to anyone who happens to be inside the house. Another drawback of the ionization detector is the false alarms. Here is how one person solved this annoying problem. These detectors are the better choice for kitchens because they respond to smoldering fires before they erupt. The alarm sounds when smoke enters the chamber, scattering the light source that normally misses the light-sensitive electronic sensor. The dual sensors are designed to alert home owners to fast-flame and smoldering fires, which makes it perfect for the kitchen. However, there are no industry standards for setting the ionization and photoelectric sensor sensitivities. That means that one system can fail without the homeowner’s knowledge. One of the best models on the market is the Kidde Battery Operated Combination Smoke/Carbon Monoxide Alarm with Voice Warning. Comes in single and multi-packs. These alarms offer many features that the other alarm systems do not. 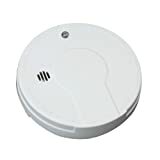 For instance, if a fast-fire or smoldering fire starts in the kitchen, the alarm will sense it and alert the homeowner of the danger via smartphone. It also syncs with multiple alarm units to pinpoint exactly where the fire is, saving lives and reducing property damage. Nest Protect offers these features and many more, which was why it was listed as the top-rated smoke detector by safewise. While the Nest Protect provides advanced protection, a single alarm costs $100, making it inconvenient for many to set up a multi-alarm system throughout their home. Easy Installation: Battery-operated detectors are typically easier to install than hardwired systems. Testing: Many brands offer low-battery alerts, while some perform self-checking to alert you of any defects. Battery Backup: Your wired system should have a a battery-operated backup system in place, in case of a malfunction or power outage. 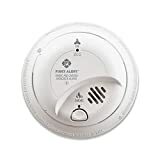 Package Deals: These can help you save money when you need to replace your smoke alarms. Retailers can offer packages with up to 6 smoke detectors. 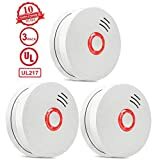 Interconnected Units: These alarms sync with each other to provide residence-wide protection against fire and carbon monoxide poisoning. Are you interested in protecting your home, rental or business from fires, both inside and outside the kitchen? Then get a free quote from Protect America. We can offer a solution that suits your needs. Don’t forget to visit our blog, where you can receive helpful tips to keep your home and business safe!